What issues matter to young people? Last year the Gazette published an article relating to research that showed that many churches struggle to working with young people. The report shared a number of findings, not least that ‘Churches lack confidence in addressing the topics young people really care about and want to discuss’. 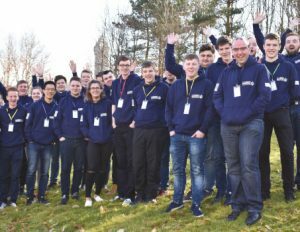 The Boys’ Brigade has a track record of partnering churches to engage young people, but how can we support churches to help them meet the needs of today’s young people and also address the issues that matter to them? At a recent youth-led Seniors and young leaders event in Scotland, ‘YouthVoice18’, BB young people were consulted on a range of topics and issues – both BB – and non-BB related. Q What they knew about their rights and how organisations can make sure that their rights are respected? Q What are the barriers to growing BB membership? Q What’s been their best experience or event in BB? Q What would they would like to see more of in BB? Q If you could change one thing about BB, what would it be? Rather than adopt a straightforward ‘question/answer’ style session, the YouthVoice18 event team adopted a creative and interactive approach. Using ‘creative consultation’ methods in a ‘world café’ setting (several stations around the room), young people were able to get their ideas and views across. This worked by groups getting time to focus on each question before moving to the next table. Responses were recorded in a range of ways; from post cards in an envelop to using speech-bubble post-it notes. Facilitators looked after each table to provoke discussion and give everyone the opportunity to speak. Why not try something similar within your Company, or perhaps at a wider level, such as Battalion or District? These could be very worthwhile experiences and help us listen to the needs of our young people, focussing on the issues which matter to them. You could adopt similar questions to the ones above, or adapt them to your own setting. Importantly, consider how you will be able to act on the views put forward by your young people.